Joseph Munoz asks David Leland Hyde about growing up exploring and wilderness traveling with his mother and father Ardis and Philip Hyde, representing Philip Hyde with photography galleries, the transcendental view of nature, what it’s like being the son of a “famous photographer,” Sierra Club Books, the upcoming May 3-June 3, 2013 Philip Hyde And David Leland Hyde Plumas Arts Show at the Capitol Arts Gallery in Quincy, California and whether Quincy is becoming an Artist’s Retreat or Colony. Joseph Munoz, a professor, educator and administrator at Feather River College, won the Hayward Award for Excellence In Education. Feather River College in Quincy, California was recently named one of the top 10 academic community colleges in all California. 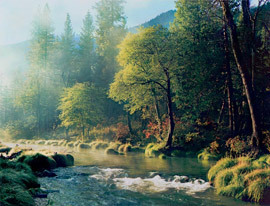 Previous guests on The Common Good have included Rob Wade, coordinator of Learning Landscapes, an outdoor classroom program for each of the schools in the Plumas Unified School District; Paul Hardy, the Executive Director of the Feather River Land Trust; and Bill Coats, one of the founders of The Quincy Library Group, nationally recognized for research and mediation of timber and lumber environmental conflicts. Oaks, Grizzly Ridge, Fall, Northern Sierra Nevada, California, copyright 2012 by David Leland Hyde. Nikon D90. One of my neighbors, who I grew up with, has told me from time to time that he had to quit photography because he became too obsessed with it. It came out that he spent enough money on gear, gasoline, printing, matting and framing to put himself and his large family into debt. That was the destructive aspect, not the obsession with the art itself. 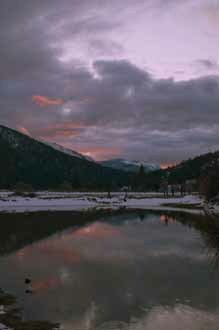 Cloudy Sunset, Genesee Valley, Northern Sierra Nevada, California, copyright 2012 by David Leland Hyde. Nikon D90. When we were young men I admired the same neighbor for his focus, determination and tireless effort that made him a success in sports, a large and strong weight lifter and an airline pilot. I contend that any endeavor of meaning, especially in the arts, for excellence to be attained, requires an obsessive dedication. This is why I thought I could never be a photographer. I still sometimes do not consider myself one. 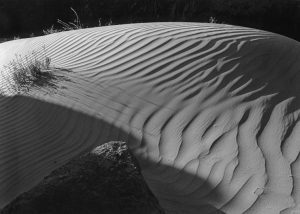 My father, pioneer landscape photographer Philip Hyde, had the passion and drive for excellence and the results to prove it, but until 2009 I had been lackadaisical about photography for 35 years. I will share more on my artistic journey below, but first I must tell you about the photographs here. Also, a big thank you to Jim Goldstein at JMG Galleries for putting this “best of the year” blog project on each year. I feel he’s a genius for inventing it. 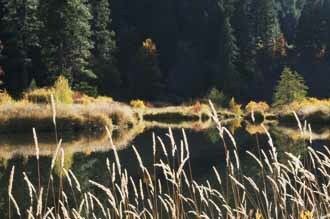 Grasses, Indian Creek Below Indian Valley, Northern Sierra Nevada, California, Fall, copyright 2012 by David Leland Hyde. 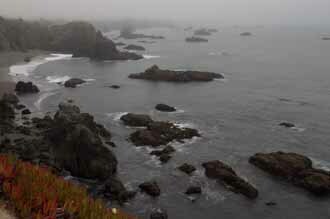 Fog, Rocky Promontory, Pacific Ocean, Mendocino Sea Coast, California, copyright 2012 by David Leland Hyde. 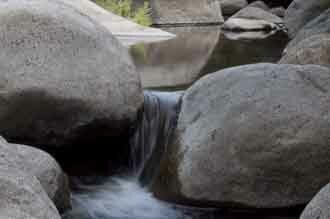 Pool, Cascade, Red Clover Creek, Plumas County, Northern Sierra Nevada, California, copyright 2012 by David Leland Hyde. newer versions of Photoshop software, but for now I will remain chained to my forced frugality of a full-time learning photographer and use my CS4, which is just fine. 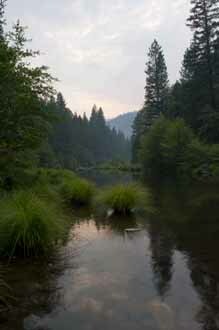 Twilight, Indian Creek, Vertical, Plumas County, Northern Sierra Nevada, California, copyright 2012 by David Leland Hyde. Ice Plant, Mist, Duncan Cove State Beach, Pacific Ocean, Sonoma Coast, California copyright by David Leland Hyde. In 2009, I first came into the digital era and bought a Nikon D90 DSLR. Until then, I had used a Pentax K1000 35 mm film camera that my father gave me around 37 years ago when I was about 10 years old. I immediately loved making photographs with the Nikon D90 digital camera because it seemed easy to obtain decent results. I would like to graduate to a better camera one of these days for the purpose of making better big prints. I purchased my camera at Costco on special. 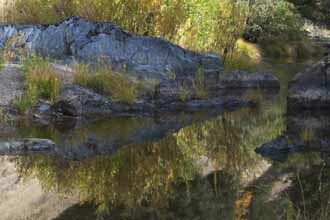 Rocks Along Spanish Creek, Plumas County, Northern Sierra Nevada, California, copyright 2012 by David Leland Hyde. They had a package that included two lenses, a camera bag, strap, an 8 MG SD Card, a video and a few other little photo items that gave me everything I needed for pro-sumer photography. The larger lens that I don’t use very often is a Nikkor 55-200 mm, 1:4-5.6 lens. I make 95 percent of my images with the wide-angle lens, which is a basic Nikkor 18-55 mm, 1:3.5-5.6 lens. I would like to buy more lenses, but cannot justify the investment until my print sales pay for the new gear. 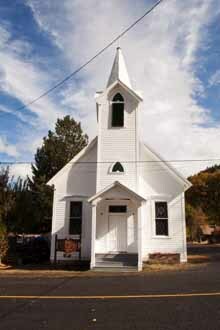 Community Church, Taylorsville, Plumas County, Northern Sierra Nevada, California, copyright 2012 by David Leland Hyde. Before 2011 especially, and even now, I have little time for my own photography, but this year I still indulged in and enjoyed the making of over 10,000 images. Meanwhile, I have other goals and responsibilities including the development of my father’s large format and medium format photography in the digital era, expanding the presence of his vintage photographs in major museums and my own long, grinding, slowly developing writing career. Until 2012, I still had many frustrations with photography and still get lividly annoyed with Photoshop today. Currently, due to several delays and complications I am blessed and cursed to be where the main subject is the wilderness landscape of the Northern Sierra Nevada. This has given me much joy, but also frustration in that I intend to photograph more people, street scenes, disasters, cultural events and other art and quasi-journalistic subjects. I would have loved to be the first photographer to arrive at the BP Gulf Oil Spill or in Japan at the Fukushima Daiichi Nuclear Disaster. 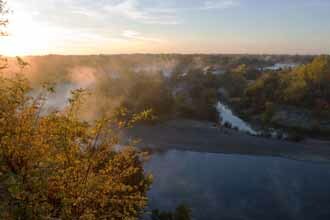 Dawn, American River From Fair Oaks Bluffs Near Sacramento, California, copyright 2012 by David Leland Hyde. 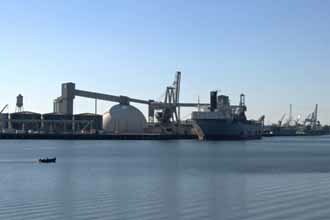 Port Of Stockton, San Joaquin River Deep Water Tidal Channel, Great Central Valley, California, copyright 2012 by David Leland Hyde. 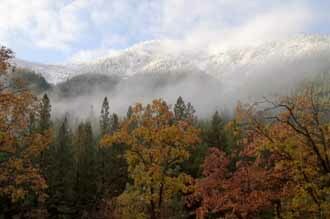 Indian Creek And Forest From Above, Fall Snow, Northern Sierra Nevada, California, copyright 2012 by David Leland Hyde. screen. 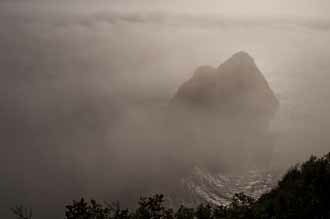 Landscape photography has helped me feel the light on the mountains, smell the woods, hear the lulling water and expand into the spirit of open spaces. I am rooted and connected to nature more often. Yet for me any genre of photography, photography without borders, without labels or definitions, pre-planned or visualized, observed quietly or full of surprises and experimentation, any and all of it is a hoot and an inspiration. Now after almost four decades of carrying a camera off and on, I can finally say, it is an obsession. 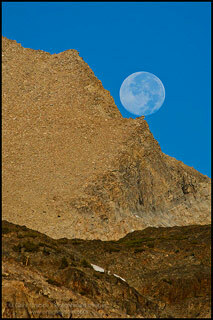 Full Moon Setting Over Rock Outcrop Near Tioga Pass, Yosemite National Park, California, copyright 2010 Gary Crabbe. DAVID LELAND HYDE: I read your articles on working with Galen Rowell on Naturescapes.net and on your Enlightened Images blog. In your website bio it said you started taking photographs while you were going to college at Humboldt State University. GARY CRABBE: That’s correct. It was one of those art electives to make me a more well-rounded square. 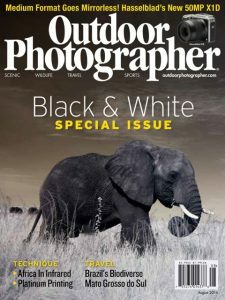 It was basic black and white photography 101 and an introduction to composition, how to use the enlargers in a darkroom, process film and all that fun stuff. HYDE: Did you make your own prints? GARY CRABBE: I certainly did for that class. Also, I started taking photos for the Theater Department in 1988 or 1989. I bought a bathroom darkroom setup. I’d literally shoot photos of a stage production in dress rehearsal. I would get up on stage with a little old manual Minolta X-370 camera, some 3200 speed Tri-X film, shoot without flash, hand held. Because I was also an actor and director I had a sense of what to shoot. Then I’d run home and print 20 or so 8X10 RC prints that night and give them to the theater department the next morning. The art department mounted them on mat boards and by 5:00 pm the Theater Department would have a full exhibit of my prints in the lobby of the theater for opening night of the play. 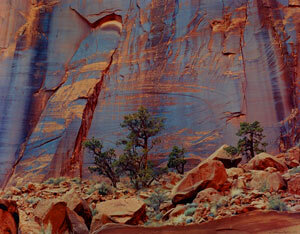 HYDE: When did you start photographing in color? GARY CRABBE: Not at all until much later. I had been working as a breakfast cook all through college and after, flipping pancakes, cooking omelet’s, all that. I was so sick of it. I was screaming profanities every morning and my wife said, “Just go for a different job.” I looked through the newspaper and applied for everything I could. One of the ads I applied for in that time just said, “Outdoor Photo Agency,” and, “must like dogs.” I didn’t know what an “Outdoor Photo Agency” was, but I like photos, dogs and the outdoors. I sent in an application, got called for an interview, showed up to the place in Albany, California, before they had the gallery in Emeryville and there was Galen Rowell’s name and the Mountain Light Gallery logo hanging over the front door. I instantly recognized it because one of the very few photographic exhibitions I’d ever gone to on my own was Galen’s Mountain Light exhibit, when it showed at the California Academy of Sciences. I got the job. I was immediately thrust in as this $7 an hour file boy, where my job was to take the slides that were coming back from magazines and publishers and put them back in their spots in the file drawers. It was an intensive sudden exposure to Galen’s work. Then I went off for three weeks on my honeymoon to Hawaii. HYDE: Your article said that when you came back the woman that had been running the stock department for Galen Rowell had been fired. Why did they choose you? For the filing job, they didn’t want someone who was a photographer. But you would think that for the stock job they would want a photographer. GARY CRABBE: You’d think that, but they had been very badly burned by some photographers that they had previously had in their employ. They wouldn’t hire another photographer. HYDE: How did they get burned? 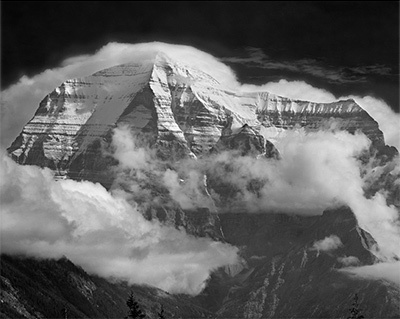 GARY CRABBE: One photographer actually had the gall to take Galen Rowell’s Rainbow Over The Potala Palace photo out of the office and make his own prints of it. 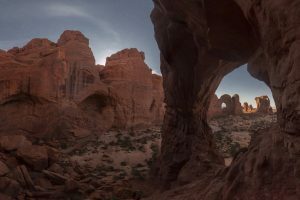 One photographer was caught submitting his own images to clients and making sales through Mountain Light, of his own stuff, when they were supposed to be selling Galen’s work. HYDE: How do you feel your background in theater and what you learned there ties into photography? And the second part of the question is: Did Galen and Barbara Rowell believe your experience with theater might be an asset to choosing photographs or being the stock manager? GARY CRABBE: I think it was the idea that I had a broader exposure to the Arts, with a capital “A.” I had some basic interest in photography, but I had absolutely zero interest in being a photographer. When I graduated college, if someone said in five years or ten years, I would be a professional photographer, I would have said that they were out of their gourd. I think probably my specific directorial talent and theater background translates into photography in that it was a form of visual storytelling. We had text, granted, that we don’t have in photography, but the idea was that you would use actors and sets to create a composition of a particular moment. When I was photographing the actors on stage, I’d be waiting for that decisive moment. I would be able to communicate the emotional content of the scene, without the text, but still get it across so when the people were walking into the lobby that night, they would be able to build some anticipation. When the photos were used for publicity, it would hopefully spark interest. HYDE: You wrote that Galen Rowell encouraged the use of a tripod and approached 35mm photography with the same deliberate, meticulous set up of the shot as they call it, as people who use a large format camera. 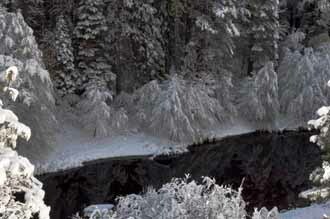 I thought, maybe that’s key to why Galen’s compositions look like he could have made them with a larger camera. At the same time you wrote, “Watching Galen’s approach to a scene was like watching a creative dynamo. I always likened it to the cartoon of the Tasmanian Devil with a camera.” When Galen Rowell came on a scene and he decided to make a photograph, what did he do? 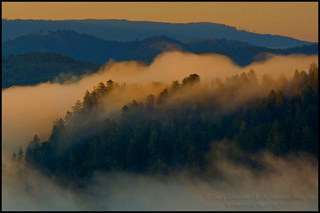 Sunrise Light On Coastal Fog Over Hills Near The Mouth Of The Klamath River, Redwood National Park, California, copyright 2010 by Gary Crabbe. 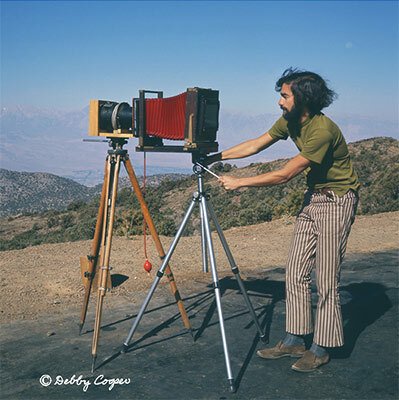 GARY CRABBE: Galen would often tell his students in a workshop that when they were shooting landscapes they should take their time and treat it as deliberately as someone setting up a large format camera. His own way of pursuing photography was a bit different. Galen, in semi-jest, described photography as an action sport. His brain was turbo charged. His experience allowed him to work and recognize things at a quick pace. When it becomes innate, you walk up on a scene and you know if you need to change lenses and when. You know which filter you want to use. You know you need a fast shutter speed. These thoughts are coming almost instantaneously. You are reaching in the bag and you’re not even thinking about it, your body is doing it. That’s because you have absorbed the skills and the science of your art to a point that it is deeply engrained. That’s the way Galen approached and did his own work, but for students who hadn’t reached that level, he taught the deliberate landscape. Galen would say, “Oh, I like this,” and he would set up and make the shot. Then he’d say, “Ooh, I like this,” and he’d go get that shot. “Ooh, I like this over here,” and he’d run 100 yards and set up another shot. He was doing what he advocated the student‘s to do, but at 8X speed. That’s the Tasmanian edge. In one of his video’s he’s literally running by the shore of Mono Lake going from one spot to another. 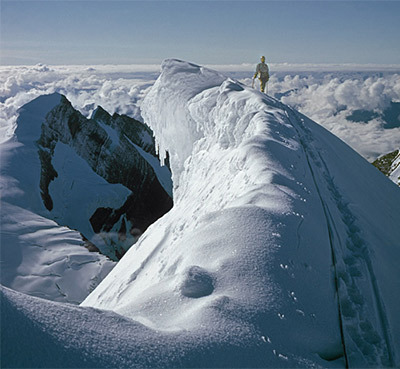 His landscape photography was an action sport, because he was so active getting to the right place at the right time, or trying to connect whatever was happening here with whatever was happening over there. HYDE: My father, Philip Hyde, had a more contemplative approach. I don’t know if you’ve seen my blog post, “Galen Rowell And Outdoor Photographer Style.” It compares my dad’s style, which was very yin, meditative and receptive to Galen Rowell’s approach, which as you say and as he wrote was much more of a yang, create the photograph you want style: “I’m visualizing. 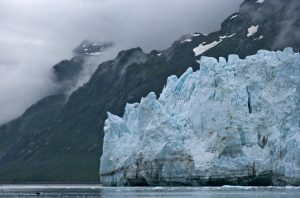 I’m going to go out there and based on the situation I’m going over here and I’m getting this and going after that.” I also notice there are differences between the approach that comes out of using a large format camera and using a 35 mm camera. For example, I’ve only ever photographed with a 35mm camera, I guess I did actually take a few photographs with a medium format, but I’ve never photographed with a large format camera… I notice if I’m photographing a car, I’ll make 30 photographs of that one car. Whereas, my dad used to sort of frown on that approach to photography. He frowned on just going out and banging away, making loads of photographs, roll after roll after roll. But I find that’s what I do. The smaller camera’s more conducive to that, but is that what Galen did? GARY CRABBE: I think as you point out the key to the difference in approach was format. 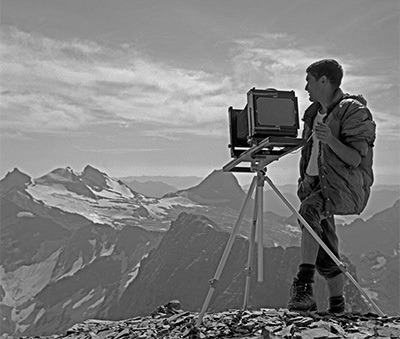 Galen would say to students, “Oh, there’s too much foreground,” or “Oh, how come you didn’t see this ugly stick down here,” or “You’ve got all this nasty stuff going along the edges.” You’re right, with large format, you only have one frame. You may shoot five frames your whole afternoon out. You have to be very deliberate about things like: Is there anything along the edges that I don’t like? Is there a nice visual pathway? Is the composition right? Is it better from here or is it better over there? That’s the approach Galen was trying to encourage his students to take. He was bringing them to a better level of photography through a more deliberate cognitive awareness of what they were doing. With Galen though, he would go out with one, two or three primary guiding ideas that set his compass needle and the rest of it was responsive. 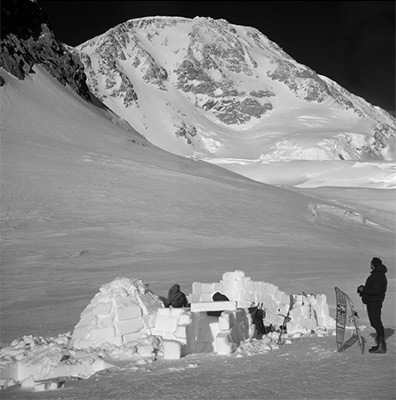 Once he got out to the spot where his pre-visualization took him, active visualization took over. That’s when he would turn on his little dynamo. So it was a little bit of both. He’d have a very strong idea with elements A, B, C and D. He would go to the field at this time, somewhere in this general angle and then he’d start looking at, “OK, there’s A and there’s B and there’s C. And if I want to get A, B and C together I need to move myself over there.” And that’s how I learned to do it too. 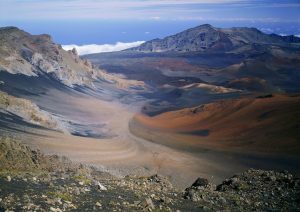 With the 35 mm format, he bracketed exposures and composition. He might go out on an afternoon run with his camera and he might take one photograph or he might take six rolls. If nothing stopped him in his tracks, he’d just keep going. If something went, “Wow, this is pretty good,” he’d stop and work it. HYDE: How is your approach similar to Galen’s and how is it different? GARY CRABBE: My approach is very similar to Galen’s in that it is responsive to what I am seeing. I use a general idea to get me where I want to be. I’ve got this picture in my mind with this and that. That to gets me to the place. Then, much like Galen I hop from “Oh, I like this, I like that, I like this.” The primary difference is that Galen was so incredibly driven, working each scene, active, like a sport and a lifestyle. I’m a little more relaxed and Buddhist. I like taking my time on trails and I like to stop. I have a personal, slower pace, not only out on the trails, but in life in general. Galen was a dynamo. Sometimes I’m just happy to be a cow under a shade tree in the middle of summer. 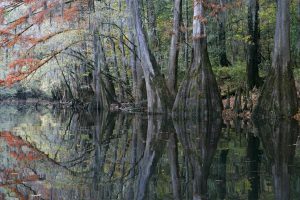 Throughout his career, Philip Hyde tenaciously stuck with large format cameras while Galen Rowell’s bywords were, “fast and light.” Philip Hyde pioneered color landscape photography, whereas Galen Rowell invented the adventure photography genre. 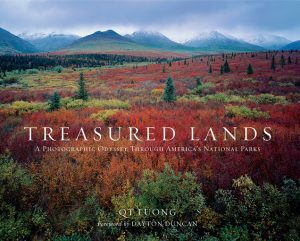 Both men saw photography as the means for a life in the backcountry and a tool for preserving the natural state of wild places. 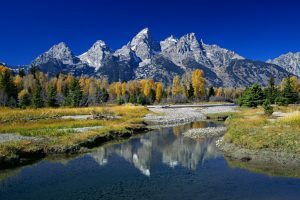 Today history is in the making again with the work of the two famous photographers on display together in the same building for the first time beginning May 8, 2010 and running through August 31, 2010 at Mountain Light Gallery in Bishop, California. 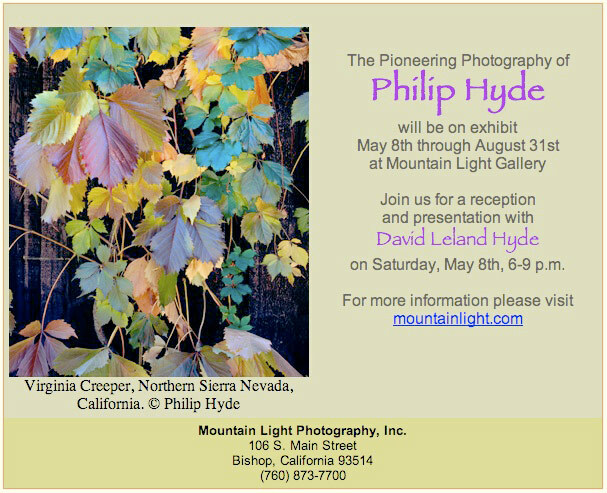 For more information and a discussion of the exciting never before seen prints on display see the blog post, “New Philip Hyde Releases At Mountain Light Gallery Exhibition,” and visit Current Exhibitions–Philip Hyde Photography.